My mom and I stayed at Kirathimos Explorers Oasis for 4 nights. Esther is such an amazing host! She is so sweet, gave us great advice of places to visit, and also took us to a beautiful spot to watch the sunset. The rooms were clean, the food we ordered there was outstanding, and the all around vibe was great. I was planning to stay at the place I’m volunteering at, but loved it here so much, I’ve decided to stay for the month! 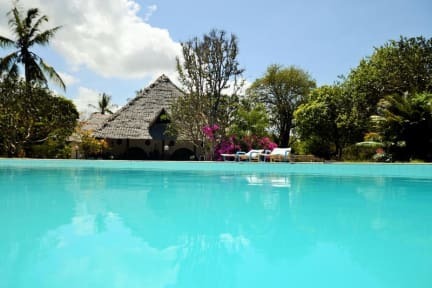 I definitely recommend staying with Esther when you come to Diani! Imagine... you want it you got it! I traveled as a solo female not knowing what to expect.. This place was everything I was looking for! A host with a welcoming loving heart, Catered to the needs and request. 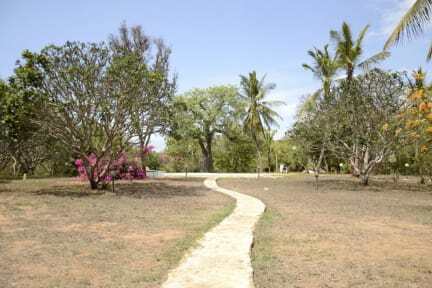 Private path Access to the amazing lengthy white sand beach and the magical colour of the Indian Ocean just a few steps away. Pool, food, drinks, wifi ect...was available right there! I had the most amazing time with Esther and the rest of her staff! She made sure me and the other guests had a great time, took us on what ever trips we wanted to, and that we paid a fair price, with both tuktuks and buying souvenirs at the market! My stay in Diani would not have been the same without you! Thank you so much! I miss you already! I thoroughly enjoyed my stay here. The owner, Esther, made everyone feel right at home. She was extremely hospitable. The hostel is really close to the beach. It is really quiet and relaxing. I would stay here again in a heartbeat. I had a fantastic time here, the hostel is very cozy, the beach is absolutely beautiful and only a minute's walk through a nice little forest and most of all, Esther, the owner of the place was super warm and welcoming! She helped organise activities, cooked a delicious dinner for everyone and was always ready to help with any question. Such a welcoming and fun hostel. Esther makes you laugh and feel at home straight away, and was always lining up activities and nights out for the guests. And joining in! The cooked breakfasts and dinner were fantastic, and having a swimming pool, garden and beach on the back door was amazing. Loved the hostel artwork and dogs too :) Would definitely recommend this place! I only stayed here for one night, and I already felt home and part of the group. The staff was very helpful and the owner especially does many extras to create a positive inclusive group atmosphere. Warning: it could be a hard place to find, as there is no sign or name at the private entrance on the main road.